These underglazes are intense, opaque colors which are especially good for watercolor effects and painting of fine detail. Semi-Moist Underglazes are packaged in pans, like watercolors. Use water and brush to apply. Pink, maroon, Peach, Rose, and Yellow all hold color up to Cone 6. All other colors may be fired to Cone 10. 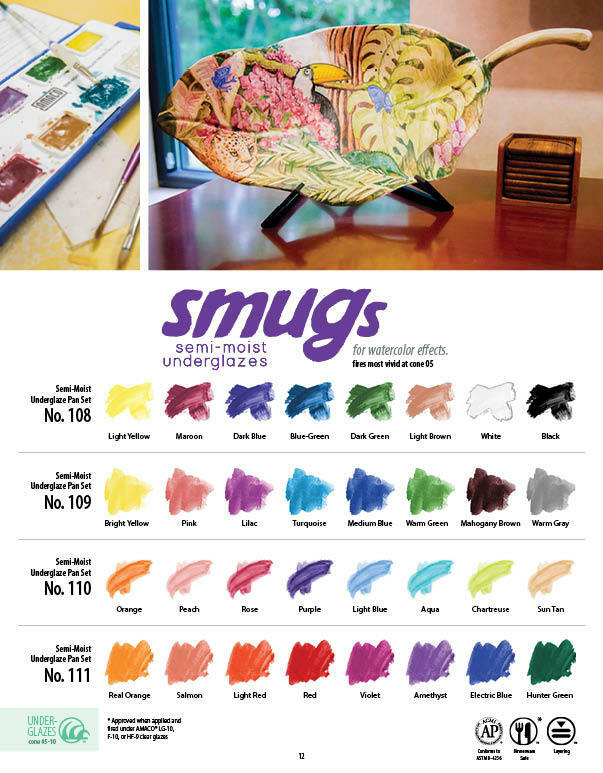 Here is a downloadable PDF of the SMUGs page from the 2015 glaze brochure. Watch the video below to see how Semi-Moist Underglazes can be used to create painterly effects. The platter was bisqued and two coats of LM-11 Opaque White were applied and allowed to dry before the SMUGs were applied.